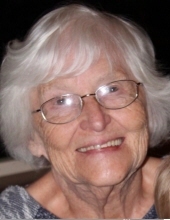 Dolores was born to John and Esther Osterback on November 12, 1929 and died on April 10, 2019. She married Harry “Red” Bauer on December 4, 1952 and celebrated their 50th wedding anniversary just prior to Red’s death. As a member of Emmanuel Presbyterian church for over 60 years she was active in the Quilters group, Women’s Association and as a Deacon and member of the choir. She shared her deep Christian faith with many. She particularly enjoyed her time at the “lake”. Her parents, her husband, two brothers and two sisters preceded her in death. She is survived by her children: Lorelee Bauer (Doug Counsell), Marty Bauer (Donna Clark), Marelee Bauer Wood (Kevin Wood) and Ray Bauer (Dianne Bauer); six grandchildren; 7 ½ great-grandchildren; and her youngest brother Vernon (Norma) Osterback. Her memorial service will be held at 12:00 noon on Saturday, April 20, 2019 at Emmanuel Presbyterian Church, W. 1926 Chelan with a reception to follow at the church and burial at Fairmont Memorial Park at 2:30 pm. Donations may be made in her name to Emmanuel Presbyterian or the Salvation Army. To send flowers or a remembrance gift to the family of Dolores Mae Bauer, please visit our Tribute Store. Reception to follow and inurnment at 2:30 pm at Fairmount Memorial Park. "Email Address" would like to share the life celebration of Dolores Mae Bauer. Click on the "link" to go to share a favorite memory or leave a condolence message for the family.